Aloe Gold Whole Leaf Aloe Vera Juice Concentrate, made from certified organic leaves, is the highest quality Aloe Vera in a bottle providing maximum benefits when taken daily. 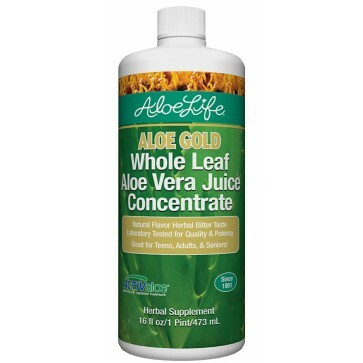 It is stronger than a 3:1 concentrate containing yellow sap (remove 3 quarts of water from 4 quarts of aloe plus filtering to equal one quart of Aloe concentrate) with solids averaging 14,500 mg per bottle, 3rd party tested for accuracy. Benefits include support with digestion and absorption when taken before meals, energy and overall wellness support. Research has shown support for immune balance, sugar metabolism, and a reduction in yeast, allergies and related skin irritations. The high quality formula contains no water and there is no ultra pasteurization used in processing protecting essential actives which includes polysaccharides.The gold is the best choice for people with irregular sugar metabolism and Candida (yeast) infections. Instructions: 1-2 OZ daily, special applications 3-8 OZ. Discount on orders of 4 or more! Use caution if diarrhea reduce daily amount. Gluten Free! No water added.